Politoscope display showing Twitter accounts that commented on the Penelopegate scandal. The redder an account, the more tweets it posted on this topic. Credit: CNRS / ISC-PIF--Chavalarias D, Gaumont N, Panahi M. 2018. CNRS and EHESS researchers analyzed nearly 60 million political tweets posted during the 2017 presidential election in France. They noted that fake news flagged by the Le Monde Decodex fact-checking website accounted for only 0.1 percent of all Twitter content, and that 73 percent of the bogus information was spread by two political communities. Their findings are published in PLOS ONE (September 19, 2018). Social media has become a major communication tool for political parties during election campaigns. For the 2017 French presidential election, a team of researchers from the Institut des Systèmes Complexes (CNRS) and the Centre for Social Analysis and Mathematics (CNRS / EHESS) led by David Chavalarias developed the Politoscope, a tool permitting real-time analysis of the activity of political communities and circulation of information within the Twitter network. The team used the Politoscope to track interactions between 2.4 million Twitter accounts during the campaign period (June 2016-May 2017). These accounts generated 60 million politically themed Tweets. 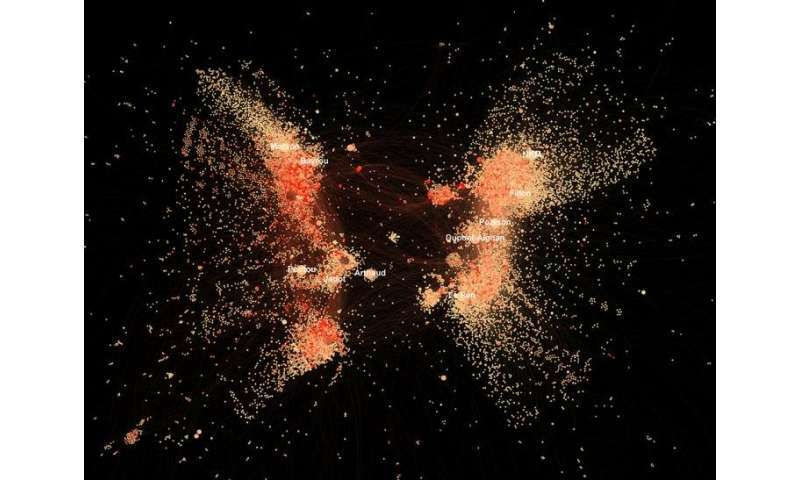 The researchers first demonstrated that it was possible to identify the political communities with extreme precision and study their development in real time. For example, they monitored the distance taken by a part of the pro-Sarkozy camp with respect to the Fillon community a few days before the Penelopegate scandal. The team collected barely 5,000 tweets (i.e., 0.081 percent of all those considered) linking to content identified as fake news by Le Monde Décodeur fact checkers. Hence, the researchers did not detect a Twitter fake news "tsunami," though they do believe these figures are underestimates. Politoscope display showing political landscape three months before first voting round of presidential election (top) and throughout 2017 (bottom). Political communities are distinguished by color. 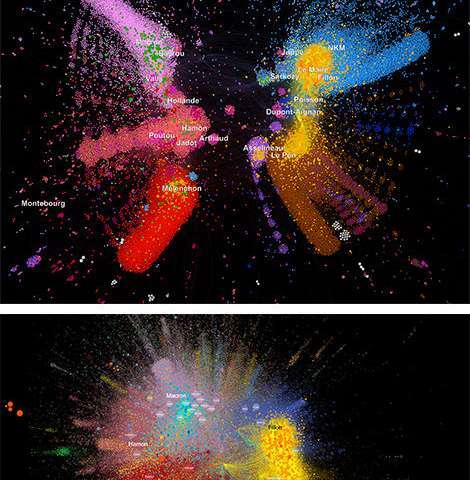 The nodes of Twitter accounts associated with the main presidential candidates have been labeled. Using the map of political affiliations as a base layer, accounts that spread fake news are highlighted in yellow, while those debunking such false information are colored green. Credit: CNRS / ISC-PIF--Chavalarias D, Gaumont N, Panahi M. 2018. Basing its investigation on the Le Monde fake news list and observations of the 200,000 Twitter accounts affiliated with political communities, Chavalarias's team studied the role of these communities in the spread of false information and the extent to which such bogus news gained ground among the 2 million accounts—referred to collectively as the "sea"—that were not linked to a political community, but which posted political tweets with varying frequency. According to the researchers' analyses, 50.75 percent of the fake news was tweeted by the Fillon community; and 22.21 percent, by the Le Pen community. These two groups thus accounted for the vast majority of fake news stories circulating within the Twitter network. It should also be noted that only 18.9 percent of the fake news was spread by Twitter users in the "sea," although these same users produced 43 percent of the 60 million Tweets collected.